Three military-styled female anime characters are all what it takes to increase volunteer numbers in the Japan Self-Defense Force by 20 percent. Last July the Japan Self-Defense Force's Okayama Provincial Cooperation Office began using three anime mascots to represent three military branches and its uniforms. Upon introducing the three characters, applications for the JSDF have increased by 20% in the Okayama prefecture. 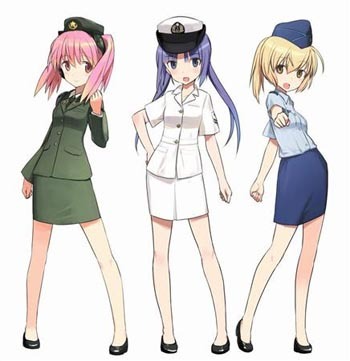 From left to right, the Japan Ground Self-Defense Force (Army) is characterized by Momoe Kibi, the Japan Maritime Self-Defense Force (Navy) has Mizuho Seto, and the Japan Air Self-Defense Force (Air Force) is typified by Airi Bizen. These characters are far from the first to be considered "military-inspired moe." The characters' aesthetic is similar to Strike Witches and Girls und Panzer, both of which have characters created by Humikane Shimada, who also designed the JSDF characters. The first mascot, Momoe, was introduced in July. JSDF printed 500 flyers of the character for a comics sales event. By August for the introduction of Mizuho and Airi, popularity of the mascots had spread outside Okayama, and 6,500 calendars and 90,000 postcards were all taken at a promotion. It's worth mentioning that if someone needs to be motivated by an anime character to join a military branch, perhaps that person is not suited to be in the military. Cuteness certainly sells.